How do you use a Qibla compass? HalalTrip’s Qibla direction feature is a great solution for Muslim travelers who face the problem of finding prayer directions when traveling. Here's how you can use the Qibla direction feature and the prayer calculator feature on HalalTrip to figure out accurate prayer times and direction when traveling. The definition of Qibla is the direction of Ka'abah in Mecca in which Muslims face in prayer. 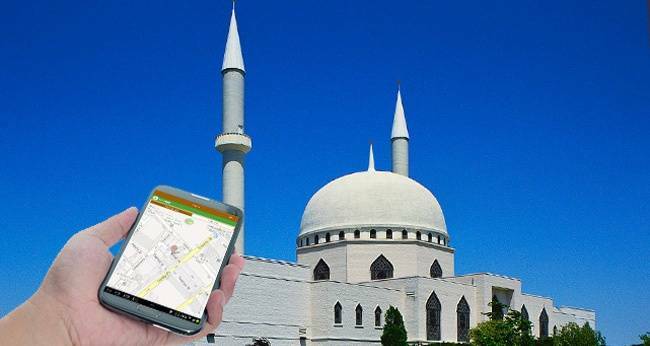 HalalTrip app offers Qibla direction compass for mobile with three types of Qibla direction finders - Dynamic, Static and Map. Make sure to have your internet connection and location services enabled for accuracy and always ensure you are away from other electrical and electronic devices. Enable the location detection, click on the "Dynamic" tab and place the phone on a flat surface. The online compass Ka’abah pointer will then show the direction of Qibla. The Online compass may not be accurate when used inside buildings, such as hotel rooms due to other magnetic interfaces. You can use this feature if you know the direction of north. To use this feature, enable the location detection, click on the "Static" tab and place the phone on a flat surface. The device will show the Qiblah direction from "North". If you know the North, then align the "North" pointer to the north, the Ka’abah pointer will then be the direction of Qibla. This is the most accurate way to find the Qibla direction, especially inside buildings. Simply have your location service switched on, and the app will detect the direction. Zoom in and you will see a green arrow pointing towards the direction of Makkah (Mecca). Align the device with a nearby landmark/road and you are good to go. You can also find your Qibla direction from your location online. Just input your location and follow the Map Qibla Direction method instructions. So you’ve got your Qibla direction down…now onto your prayer time! HalalTrip App also has a Prayer Times and Mosques feature for you to locate these aspects at your convenience. Make sure to have your location service and internet connection on and the app will detect the times accordingly. It will also display your nearby mosques and you can add in your accommodation location under the traveller tab if you have to pray back there. HalalTrip website Qibla locator found here! HalalTrip website Prayer times found here! HalalTrip Mosque Listing found here! Need to find Halal food near you? Click here! With today’s convenient technology, it is a matter of effort when it comes to prayers. HalalTrip’s free app (now on Apple and Android!) covers everything a Muslim traveller needs, from nearby Halal food to travel du'as to finding Salat times, nearby mosques and prayer spaces. Now there’s no more excuses!